Aside from the fact that T-Mobile CEO John Legere directly tweeted this to me which makes me feel all kinds of appreciated this morning, it’s another great ad. The follow up to Monday’s attack on AT&T now lumps Verizon’s upcoming Edge plan in the the same aggressive boat as AT&T’s Next upgrade plan. I couldn’t have said it better and while I stand by the assertion that T-Mobile’s JUMP! plan still has its own set of limitations, it’s a night and day offer comparatively. 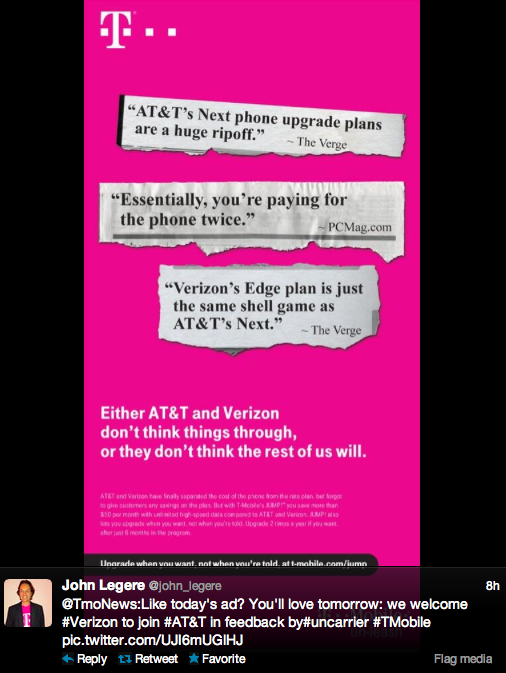 So what do you think, is this more aggressive T-Mobile print marketing for the better? I say hell yes. This is going to sound crazy, but by the end of 3rd quarter 2014, I expect T-Mobile to narrow the gap between 2 and 3 to the point where it is highly likely T-Mo can overtake #2. Insane? Yes. Then again, so is Legere. And we all love him for it. You mean between 3 (sprint) and 4 (T-Mobile)? No, 2 and 3. Sprint won’t stay at 3 for long. I’d expect T-Mo to overtake them by Q1 ’14. Hence Q3 ’14 being the target for the move for #2. Your projections are so true. John Legere may have a few screws loose (personality wise) but we all have to admit that he is a very astute individual when it comes to the telcom industry. Look what he did for Global Crossing a bankrupt data company turned into a major player in its sector of business and look at what he did to T-Mobile within a year. So I see T-Mobile surpassing Sprint by next year and Softbank has to give Sprint an major overhaul which would take about 5 years to completely take place. In my opinion through my analysis I personally believe T-Mobile will acquire DISH Network and receive the LIONSHARE of the 600MHz spectrum the government is auctioning out next year. AT&T and Verizon are being capped (limited) on the amount of the spectrum it can get. Sprint will be capped also so that leaves T-Mobile. I feel that T-Mobile expansion will be based on the 600MHz spectrum and can possible reach the number 2 status in the future. What makes you think T-Mobile will be the one to acquire Dish Network? Or do you mean that the merger of the two companies would happen? Why will sprint get capped? I keep hearing this 600mhz non sense. The AWS spectrum is being freed up for commercial use by the fed govt. (currently held for govt use only). Soon they will be auctioning that and be assured that tmobile and at & t will both get some. That also means at & t will be moving in on tmo territory with the AWS spectrum. That’s just unrealistic. Sprint has a 10 million customer lead over T-Mobile. Even if they gain a million customers each quarter, it would take 2.5 years to catch Sprint & that’s if Sprint shows no growth over that time. Optimistically, I’d like to see T-Mobile overtake Sprint in 3 years, but I’d honestly be surprised if it happened that quickly. EDIT: Real talk, man. AT&T has over a 100 million customers. Over 60 million more than T-Mobile. If you really think T-Mobile can approach that in one year, please allow me to partake in whatever it is you’re smoking. It has to be amazing. You underestimate the power of Legere. It is ambitious, but I think there is a distinct possibility the way he has gone about it will benefit T-Mo. The power of this kind of advertising is in the pulling of existing customers, which is the equivalent of a double-hit for other companies or double-positive for T-Mo. Either way, a 10 million subscriber lead is really only 5 million if you take 5 million from Sprint. That’s pretty damn realistic over 6 months. Once again, highly unrealistic. Even if 5 million customers defect from Sprint in 6 months, which has no chance of happening, they’re not all going to T-Mobile. Do some research before coming up with such unrealistic figures. Moves in the mobile industry just don’t happen that fast. I think that you underestimate the power of the Baby Bells’ subsidiaries, their marketing power and their lobbying power. As long as there are Baby Bells, they will be numbers 1 and 2. Hey Don’t hate on his optimism… The only real limit to our potential is that which we place on ourselves. I love your second clause. I say that all the time because it’s so true, but I’m not hating. Just being realistic. I feel you…. But when the odds are stacked against you thats your true opportunity to shine. I’d rather think we can shine than think that we’re not capable…. ESPECIALLY given the blows to the industry TMO has been landing lately. Let’s look historically, except you can only project and assume. T-Mo is in a situation, and is creating a volatile storm in the carrier/subscriber mold. They have already seen a nice little uptick in customers switching, and this will continue to happen at an increasingly faster rate. Just because it has never been done before, and all your data says it can’t happen again doesn’t mean it won’t or it can’t. There is a first time for everything, and to assume a market shift is impossible is just as insane as assuming it is possible. All it takes is one very strong catalyst and a financial meltdown. And if you don’t think that can’t happen within a year, you don’t pay attention to the news much do you? I pay a ton of attention. I guess we’ll see who’s right in a year’s time then, huh? A little over a year. End of Q3 is October. And I said narrow the gap between 2 and 3, and that T-Mo would be 3. Just so we’re clear here. Because I also expect you to come back here in a year on some article that has nothing to do with this particular discussion and randomly admit I was right (or I was wrong). Fair enough. Of course, we’ll know whether or not it’s actually gonna happen well before that. But I fear the SoftBank merger might make it harder for T-Mobile to reach #3. Since you have his ears, ask him about expanding coverage beyond metro areas where edge or no service exist. I, too, think there is momentum building for T-Mobile. I just switched from Verizon (after 4 years of service) this past weekend, and so far so good. It just makes me feel better that my money is going to someone whose policies are more customer based. I’m just hoping they use the new customer influx to update their 2G to 3/4G and bolster metro LTE. I would happily use a network of rural 3G and metro 4G. Anyone who thinks they need 4G everywhere is crazy. Of course, maybe it would be more cost effective to just rollout a complete 4G network. Only the bean counters know for sure. It’s possible they do not have spectrum in those areas to turn up 3G or 4G. Yes GSM and 3G U1900 run off the same spectrum but they may not have enough 1900 spectrum for 3G unless they turn of 2G. Unfortunately GSM is an international standard that phones around the world use. Many are phasing it out though. ATT plans I completely divesting itself of GSM by 2017 I think.. If TMUS completely dropped all of GSM and converted it to HSPA tomorrow, my feelings would not be hurt. I don’t think it would be as bad as some think. However, I think TMUS has some businesses that use it as part of their networks? if I remember.. so they can’t..
Consumers are more ready to upgrade that businesses. One could say that anyone who thinks that he needs a phone with him everywhere he goes is crazy. People want what they want; there is no need to call them crazy for wanting it. I tried LTE on my uncles new GS4. It was faster than the LTE I get on Verizon. It was 24 mbps down. On Verizon I get 11mbps(in 2011 I got 17mbps down). That seems to be par for the Verizon course. I guess it makes sense that the nation’s largest carrier is also the most congested. WOW that was FAST on Verizon LTE. Its’ funny because I had an iPad 3 on Verizon, and I loved looking at the LTE pop up at the beginning of the year EVERYWHERE i went. Unfortunately it was slow as molasses, omg! I did speedtests all the time, the highest was 8mbps!!! In rural areas, New Fairfield, CT to be exact, where Big Red claims to supercede T-Mo, I was getting an awesome 300k! I luv it, LTE lightning speeds on Verizon are a joke..! Before I forget, now I get HSPA on my N4 in New Fairfield, CT. Thank you T-Mo! T-Mobile’s customer service has been unbelievably frustrating lately. I was completely unable to upgrade a phone on my account through the website or over the phone despite five or more phone calls over a week. I was told multiple times that they would call me back later in the week to verify that everything was going through, but never once received a follow up call. I was told that all was taken care of only to find out my order was cancelled (6ish times!). Finally, I was given a small credit for my time and was sent to a physical store to make a purchase. This, despite the fact that the stores do not carry the purple Xperia Z (which is what the Wife wanted) and the nearest store is 45 minutes away. Unfortunately, my Wife needed a phone ASAP since she is headed out of town soon and recently broke her Galaxy S2. It was terribly frustrating how they made it impossible for me to commit nearly $600. I was ready to walk away, after fifteen or so years. Then it dawned on me, AT&T is EXPENSIVE! Given, they have coverage in many places T-Mobile does not, but 98% of the time I’m in my home market. So until I start traveling more, I will stick with what’s affordable, despite the horrible customer service. John is exactly right, though. There is no discount on the large two when you are off contact and not paying your subsidized device fees. Let’s face it, that’s some BS right there. T-Mobile really needs work in the customer retention department, though. When I’m trying to give them money and essentially commit to another two years, they shouldn’t act in such a way that I’m starting to shop around. That’s a complete failure on all levels. All I can say is, if they weren’t significantly less expensive than the others, I would be out. I do still recommend T-Mobile to friends, but I let them know up front what to expect: the best value with terrible Customer Service (in store CS tends to be very good, though). I honestly don’t know how some of my friends afford AT&T/Verizon. This aggressiveness is what’s been lacking until Legere took over. T-Mobile is no longer the doclie carrier that it once was and now as UNcarrier it’s shaking up the industry by exposing the subsidy scam and innovating with programs like JUMP. The Twin Bells’ cheap trick only benefits them and it’s a lame attempt to copy UNcarrier. The future looks good for a change. One of them tried to run for Mayor of Seattle. I forgot his name; he had the personality of a lobster. I never like attack ads. It always makes you look desperate. That said, I hope phase 3 of the UnCarrier changes is shared data plan. 500MB per line is probably not enough, but 2.5GB per line is probably too much. I’d love a Ting approach to T-Mo billing at least for the data plan. The CEO said it himself. He doesn’t believe in shared data. He doesn’t even like that idea. Thank god this guy is putting himself in our shoes. Well… Sorta. I normally don’t like attack ads for similar reasons. However, I think that this is an exception. T-Mobile is the company that can call out AT&T and VZW for double-dipping like this, since consumers (as a whole) refuse to. And, the time is right for this counter-attack. Its good advertising but reading commits on other sites and talking to people they always bring up T-Mobile’s coverage. Its always how “LTE is good but its only in the major cites” and then people say something like “T-Mobile doesn’t have 3G or 4G available in rural areas and out side of the cites you only get edge.” Until T-Mobile does something about their coverage and in some areas just the perception of the coverage in areas they do have good coverage then attacking the competition on better plans wont make people switch if they think they wont have service. Reality is and has been for some time that T-Mobile is considered the “value” carrier and have been weak as far as rural coverage. It’s nothing new. What commenters on other sites fail to address is how AT&T and Verizon’s plans are no bargains at all and in fact make the customer pay for their device twice with nothing to show for it except a new device (once a year.) AT&T and Verizon’s offerings are also for those people who just have to have the latest bleeding edge device and can’t afford to plop down full MSRP. In more detail, I’m glad to see them attacking BOTH Verizon and AT&T. It’s good as far as it goes. Mr LegÃ¨re fails to mention that the JUMP program is hardly a give-away and is hardly the best thing for the end user unless that user absolutely has to have the most current most bleeding edge device every six months. Why would Mr. Legere claim that the JUMP! program works for one customer over another? It’s up to the customer to make that determination, he’s just provided us with another choice if we want it. “most current most bleeding edge device every six months” is for some T-Mo customers, this is why they’ve created this. They’re not forcing EVERY Tmo Customer to join JUMP, theyre simply satisfying a need (cheaper) for that category of customer. and grand pas can keep same phone for 6 years no one is forcing them to join jump program. Instead of me searching new phones on craigslist ebay each 6-8 months, i can simply join jump program, SAFEST way to upgrade. I love the changes going on with T-Mobile! I have been a long time member and I plan on hanging out for the long haul! Keep kicking the can at them T-Mobile, keep kicking the can!!! I was with Verizon going back to around 2000 or 2001 and then I was with out a cell for about 2 years and then got back with them in about 2004. Just two months ago I left Verizon because I got tired of paying such high prices and now I pay $50 a month. yes my service is not as great as it was with Verizon but seriously its no big deal I have been able to get service 99 percent of the time. Even on my trip from California to Idaho I had signal in most places. I am so happy TMobile has been making these bold moves and I know Verizon and ATT are watching because Tmobile is coming up foreals.